When this panel was offered for auction at the Helbing gallery in Munich in 1919 it was catalogued as a painting “in the manner of Taddeo Gaddi”. This attribution was modified by Perkins in 1924, who published the panel in Rassegna d’Arte Senese as a work by Luca di Tommè. The attribution has not been questioned since that time, but the date of the panel has been the subject of debate. Luca di Tommè was one of the leading Sienese masters of the late 14th century. His name appears in a series of documents in Siena where he is recorded as a member of the painters’ confraternity in 1356. Di Tommè worked with painters such as Niccolò di Ser Sozzo, with whom he signed a polyptych now in the Pinacoteca Nazionale, Siena. 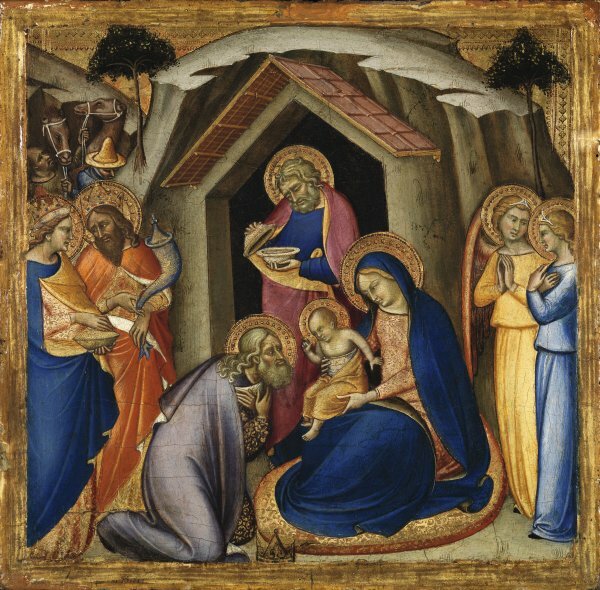 The last written reference to the artist dates from 1389 and refers to a payment for an altarpiece in the Calzolai chapel in the Duomo in Siena. The present painting was part of the predella of an altarpiece. In 1963 Meiss identified the central panel as a Crucifixion now in the Fine Arts Museum in San Francisco. In order to establish this connection Meiss studied details such as the decoration of the gold haloes and the decorative borders, in addition to more general stylistic characteristics. In 1979 Cristina de Benedictis proposed two further scenes for this predella, The Nativity and The Presentation (both private collections) but without including any photographic material in her text that could demonstrate the validity of her suggestions. The first photographic reconstruction of the predella was made by Gaudenz Freuler for the catalogue of the exhibition Manifestatori delle Cose Miracolose, in which the present painting was included. In addition, Freuler suggested subjects such as the Rest on the Flight into Egypt and The Massacre of the Innocents for the panels that would hypothetically have terminated the predella at the right end. Luca di Tommè filled almost the entire pictorial space and only used gold for the background, the haloes, details of clothing and the crowns of the Magi. The Virgin is presented in an unusual pose, seated as a Virgin of Humility on a large cushion and holding out the blessing Infant Christ to the elderly Melchior, who has placed his crown on the ground as a mark of respect. The structure of the stable is also interesting, taking the form of a precisely carved out cave whose entrance is protected by a small sloping roof. In the opening the artist placed an unusual figure of Saint Joseph who takes part in the scene by holding Melchior’s gift, which he examines carefully. Caspar and Balthasar on the left with two camels and their drivers behind them, together with the two angels on the right complete this attractive Adoration of the Magi, which is based on a composition by Pietro Lorenzetti.